My MIL came and spent 9 days with us. My wife and the kids had a ball with mom and granny hanging around. While here, she took tons of pictures. We dumpped them on my comp and here are a few pics for people to see the family growing up. So, these are pics through the eyes of my MIL. Does it scare you ??? Our “small” dog with the boys ..
Hey, if you do any on-line shopping, would you like to shop and while you shop (no cost to you) donate money for our students to go on a mission trip ? If you shop through the link (680 stores) you can do that. Every purchase that you make, the store will give us a small donation. The donations that we receive are going into our mission trip account. There are some great stores that you can shop at. Also, if you register and shop within 45 days, we will get an additional $ 5. Hopefully, the plug does not offend too many. But, if you are not already supporting a cause, we would appreciate the support; especially from those who already shop on line. Also, you can get credit for donations (tax deduction – if you want ). Registration takes about 30 seconds. It has been two weeks since the original post and I have made a few updates. I have enjoyed reading and seeing what others have been involved in and their strides. I am still trying to find my way through this process. Let me give you some “progress” as I laid it out in my original post. 1. I am still going to be working with Meals on Wheels a few times a month and it looks like my wife and I may tag-team to do a route together. I have not done the route, yet. This past Friday was going to be my first day. However, I was over in Indy. My wife filled in for me in my absence and her serving in that area has prompted us talking about doing a route and covering it. 2. I went up to the clinic last week. I was in the room filing folders. It is not a tough job but a job that needs to be done. I enjoy the act of serving by placing folders into the correct med files and praying over each file as I put it away. NO, I DO NOT LOOK AT OR IN THE FILE. But, it is an act of prayer for me as I place it in the correct spot. 3. I spent sometime up at the Children Service Center this week. My heart really does break for all the kids who are in foster care. I also thank God for individuals who find it one their art to serve by doing foster care. While I was there, I talked and played (watch mostly) with a kid that is in a rough position. His case is backed up in the courts – soooo many cases. One of the cool things that we are going to be doing is “pen-palling” some of the kids in foster care. 4. The art of presence. In some ways, you would think that this would be the easiest one. But at times, it is the roughest. I am trying to be at events where the members of the church are and I am trying to “meet” people when I am out in the public. The one area where I wish I would do better would be outside the school when I am waiting for the boys. I have also taken up helping with Isaiah’s basketball team. He is happy that I am the Assistant Coach. But, he makes sure to remind that I am not the “real coach”. It was fun tonight cheering the boys on and encouraging them about their pass or shot (3&4 graders). We also as mentioned in the last post, hosted the dinner for 8 and we are hoping to invite and have more people over. There are a couple of individuals that I need to be in touch with this week, so hopefully I will be able to practice the art of presence then. An essential part of the early Christian teaching and fellowship was hospitality, a practice that awed even the roman opponents of Jesus’ first followers. Hospitality changes both the host and the guest. I have witnessed through stories a number of people who are doing great things as “host”. We, as a family, have not done much. A few days ago though, we did “host” a dinner for a few people from the church. We are part of Dinner for 8. We enjoyed having individuals in our homes and having a meal. The cool thing about that was that they were individuals we did not know. I am going to ponder how we, as a family, can be more open and how we can have a place at the table for others. What are you doing in the area of hospitality ? What are ways we can extend ourselves to those around us in need ? Maybe, it does not even have to be someone in “need”. Maybe, for us, it is having a “set night”. We will set aside one night of the week, have a meal and invite a family to join us …. Last words, they come from Nouwen: if there is any concept worth restoring to its original dept and evocative potential, it is the concept of hospitality. He then continues, hospitality is the creation of free space where strangers become friends. Tonight, we did Trunk-Or-Treat at church. This was the first year that Zion has done Trunk-Or-Treat. Anytime that you do something for the first time, it is always a little “spooky” on how it will turn out. For those of you who do not know, we are a downtown church. We try to do activities and ministries for the individuals who live downtown. We thought that providing a place for the kids to trick-or-treat would be a nice thing. So, we asked the church to come and park their cars, open up their trunks and pass out candy to the children. We had a great response from the church. On Saturday, we had individuals that came to the church building and we went around the neighborhood passing out door knob hangers advertizing the event. We also contacted the paper and had fliers out at the elementary school. We had 25 individuals that brought their cars and set it up in the parking lot. We also had numerous individuals in our church that brought candy so there would be more candy for the kidios and individuals who brought cookies for a cookie table. It was a NO AGENDA night. No adv for our church, no fliers passing out, no pamphlets on the evil of Halloween. It was just a place where kids/parents could circle the parking lot and get candy in a “safer” enviorment. We had a very good turnout. I have no idea how many kids/teenagers/parents came through. We did not worry about a count. 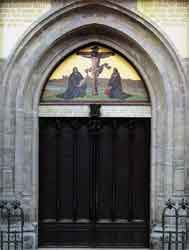 The picture above is the door of the Schlosskirche (castle church) to which Luther is said to have nailed his 95 Theses. Today is the day that he did it. Well, not today but ON this day in 1517. We have no proof of that but we do have the 95 Theses and his book that explains the theses. It was his words, not the hammer and nail, that sparked the Reformation. Luther wasn’t the first to criticize the church’s use of indulgences but he certainly is the best remembered. On June 15, 1520, the Pope warned Luther with the papal bull (edict) Exsurge Domine that he risked excommunication unless he recanted 41 sentences drawn from his writings, including the 95 Theses, within 60 days. That fall, Johann Eck proclaimed the bull in Meissen and other towns. Karl von Miltitz, a papal nuncio, attempted to broker a solution, but Luther, who had sent the Pope a copy of On the Freedom of a Christian in October, publicly set fire to the bull and decretals at Wittenberg on December 10, 1520, an act he defended in Why the Pope and his Recent Book are Burned and Assertions Concerning All Articles. As a consequence, Luther was excommunicated by Leo X on January 3, 1521, in the bull Decet Romanum Pontificem. The theses critiqued the indulgences greatly. HOWEVER, his offer (alternative) was the most powerful. He states (theses 62): The true treasure of the church is the most holy gospel of the glory and grace of God. What can the theses do for us today ???? The lesson is the following: The Gospel of God’s free grace for sinners through faith in Christ is central. Christians are to live their lives in response to this great news. One key to Lutheran Theology has been expressed in the three”alone” statements. Grace Alone, Faith Alone, Scripture Alone. The sees of these can be found in the 95 Theses. You are currently browsing the Jeff Greathouse's Weblog weblog archives. Who is this Jeff Greathouse ….